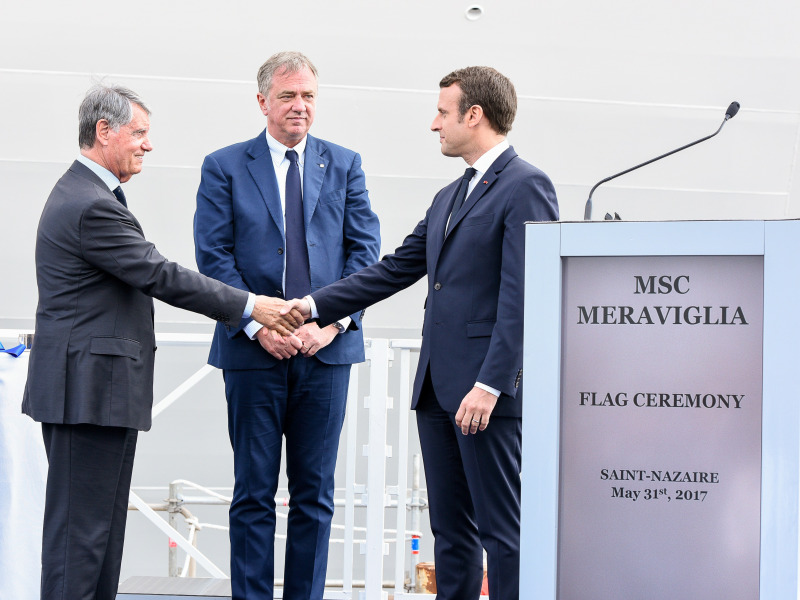 Saint-Nazaire, France, 31 May 2017 – Today at the STX France shipyard in Saint-Nazaire, France, MSC Cruises officially took delivery of MSC Meraviglia. During the ship’s flag ceremony, which pays tribute to centuries-old maritime tradition, the Company’s newest flagship received her official flag and blessings for good fortune. The Flag Ceremony was attended by Mr Emmanuel Macron, President of the French Republic and other high-level dignitaries from the French government. At 171,598 GRT and with guest capacity of 5,714, MSC Meraviglia is both the biggest ship to ever be built by a European ship owner – MSC Cruises - and the biggest to come into service in 2017. She is also one of the six new ships due to come into service between 2017 and 2020 under the Company’s industry-unprecedented investment plan. Four of these six vessels will be built by STX France, further reinforcing a long-standing partnership that has already produced all 13 vessels in MSC Cruises’ fleet, allowing the Company to grow by 800% from 2003 to 2013. MSC Cruises, the Swiss-based world’s largest privately-owned cruise line and brand market leader in Europe, South America and South Africa, estimates that its total investment at STX France from 2003 to 2020 will amount to over 7 billion euros, effectively making the Company the country’s number one foreign private investor (when it comes to export contracts.) Considering that the building of MSC Meraviglia required 1,700 workers per month (over 3,000 per month during peak periods) and nine million man hours, and that the construction work feeds into a network of over 400 suppliers and subcontractors, the economic effects of this investment are not only widely felt across the country’s geography but also multiplied several times over. 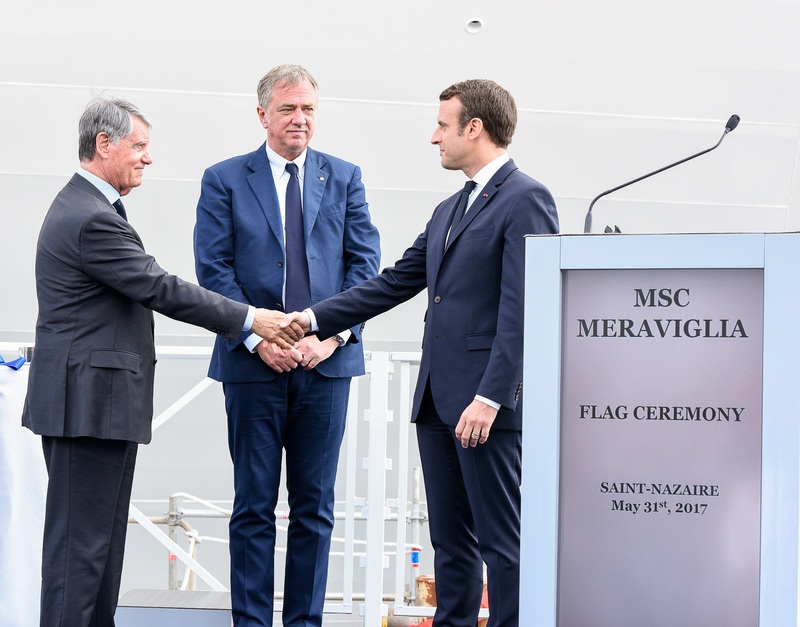 Following her christening ceremony, which will take place in Le Havre on June 3, MSC Meraviglia will start her inaugural season sailing the Western Mediterranean. During today’s flag ceremony, the shipyard’s pennant and the French flag were lowered, accompanied by the French national anthem, before Laurent Castaing, CEO of STX France, formally handed the ship over to MSC Cruises’ owner Gianluigi Aponte. Mr Aponte then gave command of MSC Meraviglia to Master Raffaele Pontecorvo before the ship’s flag and MSC Cruises’ pennant were raised. The honour of cutting the ribbon fell to the ceremony’s godmother, Ms Zoe Africa Vago, daughter of MSC Cruises’ Executive Chairman and Alexa Aponte-Vago, MSC Group’s CFO. After the traditional breaking of the bottle of champagne, three blasts from the ship’s siren signalled the end of the ceremony. MSC Meraviglia, the 13th cruise ship to join MSC Cruises’ fleet since its inception in 2003, is 315 metres long, 43 metres wide and 65 metres high, with 171,598 GRTs. She is able to travel up to 22.7 knots and has been designed to operate in all seasons and to be able to call in most of the world’s international cruise ports, offering the widest and most exciting range of marine as well as onboard features of any MSC Cruises ship to-date. After the closing of the flag ceremony, MSC Meraviglia is due to set sail towards the Port of Le Havre for her christening ceremony on 3 June. She will then begin her first sailing along the Atlantic coast, calling at Vigo (Spain), Lisbon (Portugal), all the way to the Mediterranean, calling in Barcelona (Spain), Marseille (France) and eventually Genoa (Italy). She will commence the first regular 7-night itinerary on 11 June, sailing from Genoa on to Naples (Italy), Messina (Italy), Valletta (Malta), Barcelona, Marseille and back to Genoa on 18 June.